Prototype: Express train steam locomotive of the genus Bavarian S 2/6 in black / red paint scheme as the 15 series of the German State Railroad Company DRG. Locomotive Road Number 15 001 did around 1925. Model: With digital decoder and extensive sound functions. Controlled high-efficiency propulsion. 2 axles powered. Traction tires. Suitable for use smoke 72,270th direction change over two headlights and upgradable smoke in conventional operation and can be controlled digitally. Oncoming trains and cab lighting also digitally. The headlights are maintenance-free, warm white light emitting diodes (LED). Detailed undercarriage with open bar frame. Streamlined lining of smoke chamber, fireplace, cathedral and cylinder group as well as streamlined designed cab. Close coupling between the locomotive and tender. The tender has a close coupler kinematics with NEM. The minimum radius of 360 mm. Piston rod protectors are included separately. Length over the buffers 25.1 cm. Highlight: Complete redesign of the genus S 2/6. Very delicate and detailed design. Prototypical detail changes. Locomotive and tender are constructed mostly of metal. Digital decoder with extensive light and sound functions. Train loco of the genus Bavarian S 2/6 early 20th century ensured quick driving tests for attention on the rails of various German state railways. The Bavarian State Railways (K.Bay.Sts.B.) was in the course of this "speed rush" in 1905, an Express locomotive in order. A year later gave Maffei, drafted under the leadership of chief designer Anton Hammel S 2/6 with number 3201 from. The S 2/6 was a 2'B2' superheated steam locomotive with composite bar frame 150 km / h and 16 tonnes axle load. Novel have included the chassis concept with the responsible for tracking leading and trailing bogies and the training of the Tender water tank as a self-supporting structure. Although the locomotive had no streamlined fairing complete, there were some elements that should reduce drag. Before the cylinders there was an arched panel, the smoke chamber door was executed conical chimney and steam dome got wind cutting. The cab was also designed streamlined and went seamlessly into the boiler casing. In July 1907, the aircraft achieved with a 150-ton test train on the route Munich - Augsburg top speed 154.5 km / h, so that the world speed record. The locomotive was initially based in Munich, came in 1910 to Ludwigshafen and ran from there first express trains to Strasbourg and Bingerbrück. In 1922, she came back to Munich, from 1923, she was stationed in Augsburg. Your DRG company number 15001 has never worn because as early as 1925 was the single piece a place of honor in the Railway Museum. And so the S 2/6 played in its history without a doubt a tragic double role: although it was in 1906 technically ahead of its time and corresponded in its design perfectly matches the specification, but its conception was after a very short period of use of the rapidly changing environment outdated. Because with the exception of a few years of operation in the Palatinate area saw the S 2/6 soon in a supporting role as a loner unloved crowded. Apart from the record runs of 1907 thus remained a quickly outdated by the time construction was never built in series and disappeared after a few years of operating service. But its historical significance lies not in its operational career but in its technological and conceptual pioneer founded, which not only influenced the locomotive sustainable. 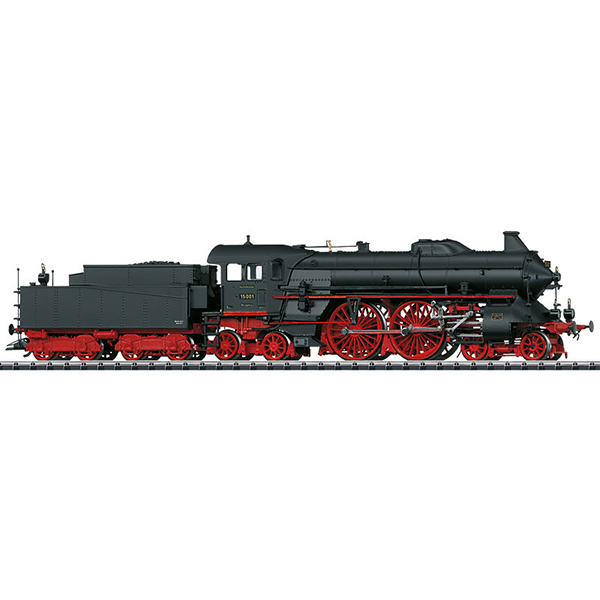 This model can be found in an AC version in the Märklin H0 assortment under item no 37016. Digital locomotive with high-efficiency propulsion. Speed ​​and acceleration / deceleration adjustable. Special engine with electronically assisted load balancing or in compact coreless type. Driving with Märklin transformer in the Märklin Delta system or Märklin Digital System (Motorola format). 1 switchable auxiliary function (function) in digital mode. Digital decoder with up to 16 digitally controlled functions when operating with Central Station 60212/60213/60214/60215. With up to 9 functions with Mobile Station 60652/60653. With up to 5 functions with Control Unit 6021. Assigned functions depending on the equipment of the locomotive.